Why was this Manual written? — To facilitate the practical implementation of a number of laws in Bulgaria which deal with the conservation of endangered species. For whom was this Manual written? — Experts from the NGO sector and everyone concerned with this topic. Biodiversity Conservation. Bulgaria has a uniquely high diversity of bats. Out of the 35 species established in Europe, 33 species are known to inhabit Bulgaria. All bats are strictly protected under the Bulgarian and the international legislation. Implementation of plans and projects with national importance. Bats and their habitats are amongst the top priorities within the The National Biodiversity Action Plan (2005—2010) and the National Biodiversity Monitoring System. Ecological Eurointegration and Partnership. In 1999 Bulgaria acceded The Agreement on the Conservationa of Populations of European Bats (EUROBATS) and other international nature protection conventions, which requires effective implementation of the relevant recommendations and resolutions. Conservation of the Bulgarian Natural Heritage. Bulgaria is one of the last refuges of populations of bat species, which are already threatened by extinction in the West European part of their ranges. That is why our responsibilities and importance for their protection are undoubted. BRCC was founded to study the distribution and biology of bats in Bulgaria, to promote their importance and to develop plans and strategies for protection and management of their important habitats. Organisation, coordination and participation in research projects on distribution and biology of bats. Implementation of new and modern methods for bat’s study and protection in Bulgaria. Coordination of the bat ringing in Bulgaria and maintenance of a data base. 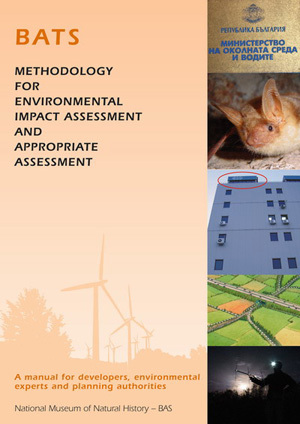 Development and implementation of a strategy for long-term national monitoring of the important bat roosts and habitats. Regular monitoring of important underground bat roosts, forests and wetlands within the scope of the National Biodiversity Monitoring System. Identifying of important bat sites and submitting proposals for establishment of new protected territories. Developments of Action plans for threatened bat species. Participation in the preparation of the Management Plans of Protected Areas. Conservation measures (SOS BATLINE and others) and advice to people and organisations for solving of practical issues, which involve bats. Development and maintenance of an information database for the bat species, their distribution and conservation status in Bulgaria, including data for the important roosts/habitats, population size and dynamics, etc. Maintenance of a library on the bat’s research methods, conservation projects, impact assessments, etc. Training of students: presentations and practical courses. Editing and publishing of information materials. Collaboration and partnership with relevant organisations and institutions. Expert advice to people and organisations in cases of bats dwelling in houses, offices, storage rooms and other potential roosts. Increasing the capacity and training of the experts working in the Regional Inspectorates of Environment and Waters and the national park’s administrations in bat conservation issues. Exchange of information and experience on species, roosts and bat habitats with regard to their conservation and monitoring on international level. Participation and organisation of national and international meetings on bat research and conservation. Assistance to foreign bat workers and teams for field research in Bulgaria.